One of the website optimization that is the article uploaded on your website must be unique, its mean the article not duplicate content. How do I know the article is original or copy content? The way is using plagiarism checker tool. One the tool that I recommend and very good tool that is plagiarismdetect.com. To check plagiarism using plagiarismdetect.com you must have an account on this website. But don’t worry you can create an account on this website for free. Articles checked using this tool will be compared with the Google search results. Why Google…!! Probably its caused Google is the most popular search engine today. Let’s test this article, or original copies. 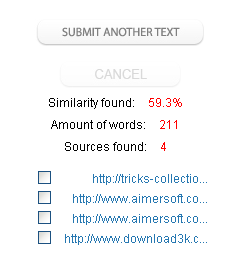 The result similarity found for the content is 59.3%. Possibility that is caused this article has indexed by Google and there are at tricks-collections.com (this blog) and hound on Aimersoft because I copied the features of the software from aimersoft.com. 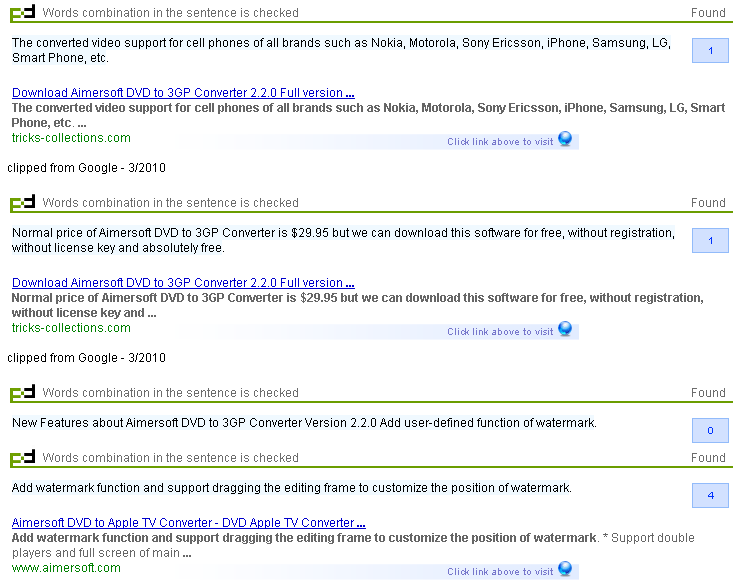 Note: The article found on eighth position on Google.com for search results for keyword ”Aimersoft DVD to 3GP Converter”. Related to "PlagiarismDetect.com Useful Plagiarism Checker Tools"
I guess using plagiarism detection software means trusting a service, because you should be very careful about giving out your work to someone else. I am a professor of English at the St. Michael’s College and can share my experience of using an online plagiarism detection service. It is called http://www.plagiarismdetection.org. I am using it for over 10 months. I have tried them in many ways. For example, I have scanned one document in Nov., let’s say. Than I forget about it for a couple of months and scan that same document in March. It does not find any relativity to other documents, so I can be 100% sure these guys are not keeping the databases. Everybody heard of scandals with turnitin and I don’t want my students to participate in someone else’s database gathering. Most of the online plagiarism detectors are not free:( I personally prefer plagiarism-detect.com It is still in beta, but it offer same results as detectors for which you have to pay. @Geoffrey Black, you’ve just scared me with your story. I work mostly with http://www.plagtracker, and I haven’t even thought that it can add my texts to database. I’ve just tried to check one of my old articles there – and it didn’t find any matches. Such a relief! But is it really such a wide-spread thing among plagiarism detectors?